The program is closed for online registration and we are unable to accept new attendees. As the first LEED Gold certified, new construction, high-rise apartment building in Illinois, Parc Huron is setting the standar d for luxury green apartment living. 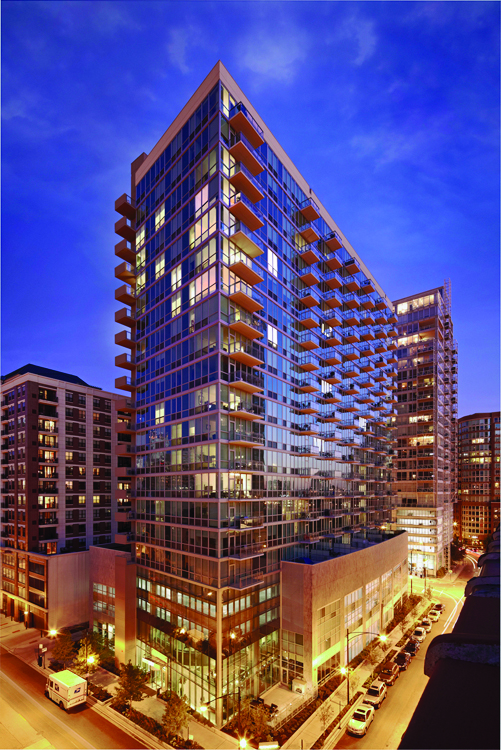 Originally conceived as a standard condominium building, the design already held building permits from the City of Chicago when the condo market crashed. The site was acquired by a new owner, which wanted to proceed with the project except for two significant changes: the building was to function as an upscale apartment building rather than with condos, and Parc Huron was to be certified with LEED Silver at a minimum. Moreover, a fast-track schedule had to be followed to achieve the owner's occupancy goal, with construction beginning as soon as the permit was issued. This program will explain the key design changes and the intense collaboration of the owner and project team that were required to exceed the project goals and achieve LEED Gold. A building tour will allow participants to experience and interacting with the elements of the design that were altered, including the building envelope, the mechanical system and the green spaces. Paul Marucci - Vice President of Development, M&R Development, L.L.C.